We carry a specialized line of body and face care products. All of these are made to be beneficial to personal well-being. All are 100% organic and use a combination of quality essential oils, natural herbs & extracts in pure carrier oils, butters and creams. 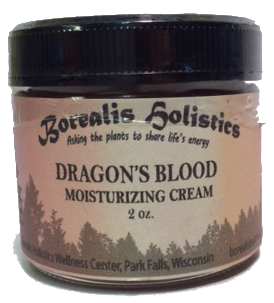 Effective moisturizing for dry scaly skin. Wound healing, anti-inflammatory. Skin tightening. Regenerates collagen. Sap extracted from a tree in the Peruvian Amazon. 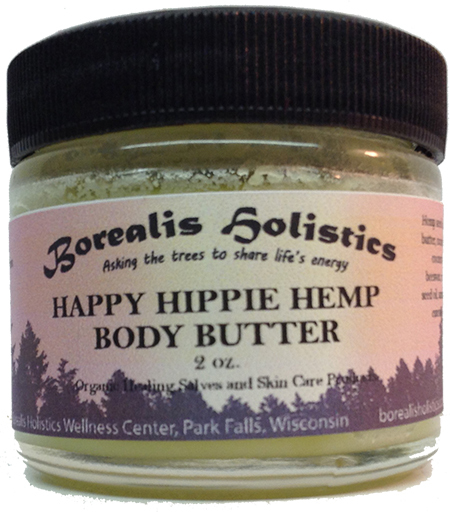 2 oz for $28.00 Happy Hippie Hemp Body Butter 2 oz. Feelin' groovy! Skin rejuvenation and anti-aging. Stress Relief Roll-on is calming through aromatherapy by application on wrists. 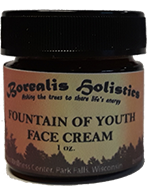 Coltsfoot Leaf Roll-on Facial Toner Anti-microbial, anti-inflammatory, tonifying effects for youthful looking skin. Headache Remedy Roll-on alleviates headache through aromatherapy. Anti-inflammatory, tonifying effects for youthful looking skin. Apply to the affected area to reduce oils and clear skin of acne. All natural with essential oils. Cleans and sanitizes with any harmful side effects. All natural with raspberry seed and carrot seed essential oils with zinc oxide. Approximate SPF rating of 30-50. All natural with essential oils. A refreshing feminine hygiene spray containing aloe vera, witch hazel, and several essential oils including jasmine & ylang ylang. Active Ingredients: Coconut Oil, Baking Soda, Bentonite Clay, Activated Charcoal, Golden Seal Supplement. Two Flavors: Triple Mint & Cinnamon. NO FLUORIDE! Quick soothing relief from the pain of sore throat irritation. 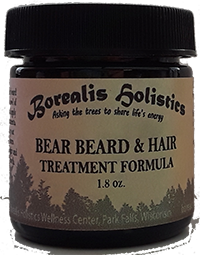 A combination of bear oil with several herbal extracts and essential oils to enhance, strengthen hair and beards. Excellent hair conditioning treatment and daily beard oil. 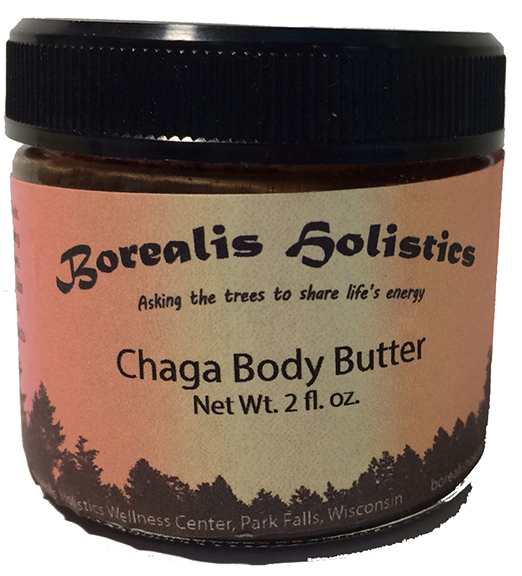 Chaga Body Butter Chaga Body Butter is developed to help soften and condition the skin with a number of organic herbs and oils. 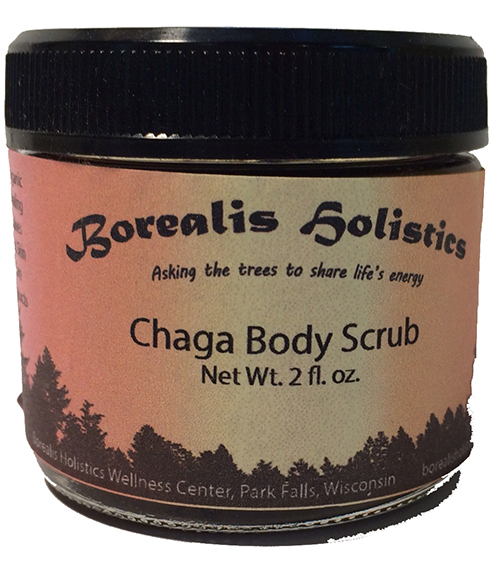 Chaga Body Scrub Chaga Body Scrub is developed to be used in the shower or sauna. Helps open and cleanse pores. Our products are for the benefit of supporting recovery of a vast array of illnesses and ailments. We are not medical professionals and do not claim any cures from disease through the use of our products. Products have not been tested by the FDA and are not intended to cure or prevent disease. All information is for educational purposes only.